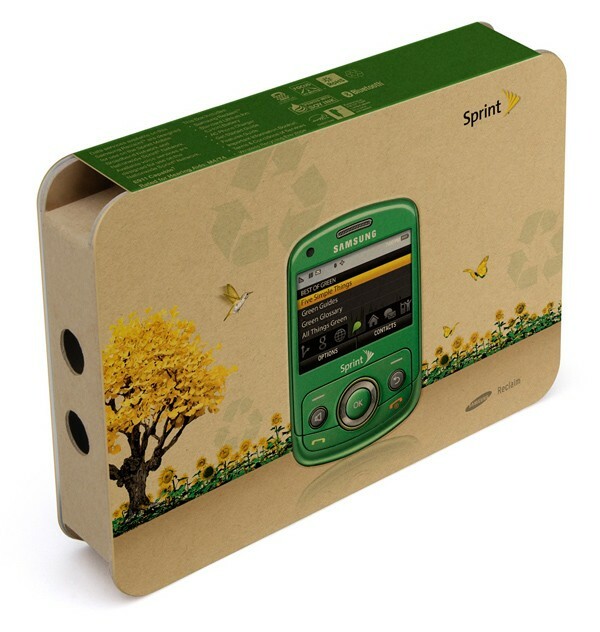 We love the Earth, and apparently so do Sprint and Samsung. The two companies have just introduced the Reclaim, a super-eco cellphone made from 80 percent recycled materials. The device -- a stout, sliding, QWERTY message-friendly model -- is constructed from "bio-plastic" materials made from corn, is free of PVC, and mostly free of BFR (brominated flame retardants)... which are apparently pretty bad. The phone also has a 2 megapixel camera, stereo Bluetooth, can accept microSD cards (we assume) up to 32GB, and has Sprint Navigation onboard. The packaging will be eco-friendly as well, as it's constructed from 70 percent recycled materials and printed with soy-based ink. The carrier will be selling the Reclaim in "Earth Green" or "Ocean Blue" come August 16th for $50 (after a $30 instant rebate and $50 mail-in rebate) with a two-year contract. Additionally, $2 of that profit will be funneled to the Nature Conservancy's Adopt an Acre program. Finally, a phone that goes with your Prius. Samsung and Sprint introduce the Reclaim -- a cellphone made from corn originally appeared on Engadget Mobile on Thu, 06 Aug 2009 09:53:00 EST. Please see our terms for use of feeds.